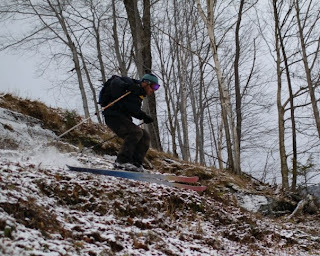 The Ski Guru loves seeing stuff like this. 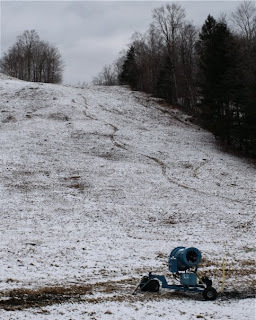 When the only game in town is Mad River Glen and they have a whopping two fan guns to lay down the fresh man made white stuff, well I guess this is what happens. December 1, 2009: Lifty Tom Hite catching a little air under Tower Three of the Single. Here is a shot of some tracks on the Practice Slope...are we really talking about practice? I guess some respect is in order. 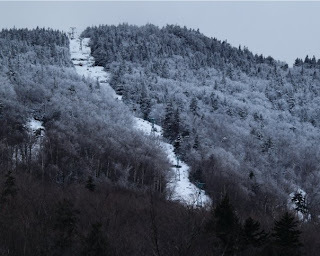 Here is a snap of the upper mountain. Cool stuff, thin cover = big balls. Wanted: Local Lange Boot Girls! Powder Alert - Sugarbush decked with SNOW!